Arclab® Web Form Builder | F.A.Q. Can I edit the .php file in my HTML editor? I want to create forms for my clients ... what license do I need? Does the script (form) work with php7? warning Can I install Web Form Builder 3/4 and 5 (or newer) on the same computer? Does the form use any external resources? Error Message: "Error: PHP PEAR not installed!" or "Error: PHP PEAR::Mail not installed!" Can I open the php file (form) directly in the browser? Can I open/edit the php file (form) in a HTML editor? Can I remove the default selection for a Radio Button Group? You can also use our alternate download (zip-compressed setup). comment Can I edit the .php file in my HTML editor? No, the .php file cannot be edited in a HTML editor! Please open the project file (*.awfb) in Web Form Builder, make the changes and click on "Build Web Form" to re-create the form. Don't forget the upload the newly created php file to your website! This means the php extension "mbstring" is not enabled on your web server. This cannot be fixed in the form - it's a configuration issue on the web server (php installation). It should be possible to enable the extension in the web server config or in the php.ini file. Please contact your web administrator if you are unsure how to enable it. If you find additional backslashs on backslashs, quotes and apostrophes then magic_quotes might be turned on. magic_quotes are DEPRECATED and should no longer been used. Please disable magic_quotes in your PHP configuration to fix this issue. Please take a look at the php.net manual for details. comment I want to create forms for my clients ... what license do I need? The "Developer Edition" is required if you want to create forms for a client's website. comment Does the script (form) work with php7? Yes, it works with php5.3.2++ and php7++. The text format options below are ONLY for previous versions of Web Form Builder (3.x and 4.x) ! Web Form Builder 5 (or newer) either allows HTML format or contains an option to change the style. You can update to the latest version here. Select your region and scroll down to "Updates" on the next page (Updates are 50% discounted). The link will be opened in a new window! The user will not leave the form! The link will be opened in the same window. This means the user leaves the form! You can use this type of link e.g. on the Success and Error Pages after the user has completed the form. Use LINKTOP to open a link as new page in the current browser window when using an iframe or frames. You can use this type of link e.g. on the Success and Error Pages after the user has completed the form. comment Can I install Web Form Builder 3/4 and 5 (or newer) on the same computer? Yes. The new version will be installed into a different folder. The folder name is "Web Form Builder 5". 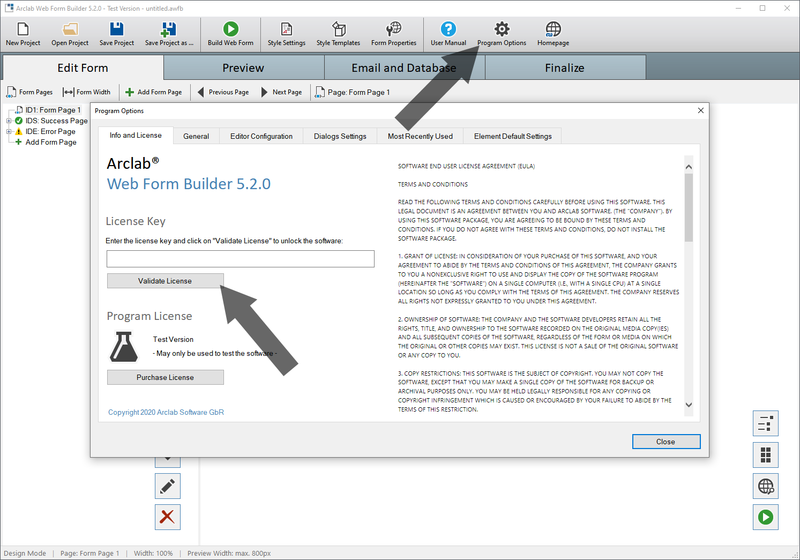 The project file for Arclab Web Form Builder 5 has the extension .awfb. You will get the error "Not a valid project file" when you try to open a file which is not a project file created with Web Form Builder 5. Please note: You cannot open projects created with Web Form Builder 4 (or older). If you want to make changes to a form created with Web Form Builder 4, then you need to run Web Form Builder 4 instead. (You can install version 4 and 5 on the same computer!). 1.) You have tested on your local computer. Please upload the php file and the host page to your web server and then open the host page in your web browser. php files can only be executed on a web server. If you use a browser extension like e.g. NoScript then add your web site to the trusted sites. 3.) You have opened the php file in your web browser. Please open the host page and not the php (form) file. 4.) You are using an old and outdated php version or php is not enabled at all. Update (or enable) php on your web server. The program requires php 5.3.2 (or newer) or version 7++. We recommend to use the latest official release either for php version 5 or 7. Please contact your web administrator or hosting provider if you don't know how to update the php version. 5.) You have renamed the php file. Please change the code to insert the form into your host page. 6.) You are using a CMS system and the form was not inserted correctly. comment Does the form use any external resources? The form uses the "Material Icons" from Google. New in version 5.0.4: The icon font is integrated into the php file. This means that the font does not need to be downloaded from the Google server, nor does it have to be hosted locally. Everything needed is in the php file created by the program. The program also includes an alternate, internal Captcha which does not require or use external resources. comment Error Message: "Error: PHP PEAR not installed!" or "Error: PHP PEAR::Mail not installed!" The script uses the PEAR::Mail php extension to send mail via a SMTP server. The option "php Mail" does not require PEAR::Mail. See also "Server and Account" in the user manual. Error: PHP PEAR not installed! Error: PHP PEAR::Mail not installed! In this case, please contact your web administrator or provider to activate the php extension PEAR::MAIL or use "php Mail" instead of "SMTP Server". Outlook > File > Options > Mail (this option is enabled by default in Outlook). "We removed extra line breaks from this message" (below To:) and select "Restore line breaks". You can permanently disable "Remove extra line breaks in plain text messages" in Outlook under File > Options > Mail. comment Can I open the php file (form) directly in the browser? Please note, php files are script files that have to be executed on the web server. So you can not simply open the form on your computer like an HTML file. Upload the php file to your web server instead. comment Can I open/edit the php file (form) in a HTML editor? No, you cannot edit the form in a HTML editor. Please use the program to make the changes and click on "Build Web Form" again to re-create the form. comment Can I remove the default selection for a Radio Button Group? Yes, add a new item, remove the item "Value", set the item "Width" to 0 (or 0%) and move the item to the bottom of the item list. Important: Don't forget to move the item to the bottom of the item list, otherwise the "required" validation (if any) would fail. Please contact us if you cannot find an answer to your question in the F.A.Q. or user manual.